Shortly before midnight on 2 December 1984, thousands of tonnes of deadly chemicals leaked from Union Carbide’s pesticide plant in Bhopal, central India. Around half a million people were exposed. Between 7,000 and 10,000 people died in the immediate aftermath and a further 15,000 over the next 20 years. 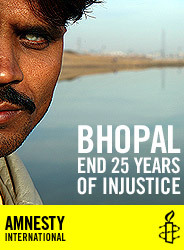 On 2 December 2009, the people of Bhopal will mark the 25th anniversary of the devastating leak. Amnesty International will act in solidarity with the people of Bhopal to highlight the ongoing human rights impacts of the 1984 leak. As the factory site has not been cleaned up yet, more than 100,000 people in the area continue to suffer from health problems. Efforts to provide rehabilitation – both medical care and measures to address the socio-economic effects of the leak – have fallen far short of what is needed and victims still wait for the adequate compensation. The people of Bhopal have struggled to obtain even basic relief such as clean water. Over the past 25 years, the Indian government has shown its incapacity to deal with the issue as companies involved have evaded accountability and obstructed the efforts of victims to secure reparation. Call on Dow Chemicals to decontaminate the former Union Carbide factory and its surrounding area. Call on the Indian Prime Minister to provide adequate medical, social, and economic rehabilitation to end 25 years of injustice for the people of Bhopal. This entry was posted in Demand Dignity, India and tagged Bhopal, Dow Chemicals, online action, Union Carbide. Bookmark the permalink.